So you’ve discovered farm fresh eggs! You love the flavor, the freshness, the golden yolks and the way they fry up in a pan. You feel good about supporting local farms and humane raising of animals. Perhaps you understand the important role that poultry can play in pest control, weed control and soil health on a diversified farm. Maybe you appreciate the variety of colors and feel good for supporting species diversity. Still, your attempts at hard boiled eggs have been coming up short. You know what I’m talking about. You follow the directions but can’t get that shell off without taking half the whites with it. Here are some tips to help you hard cook (and peel) those farm-fresh eggs. First of all, your eggs may be just too fresh. Yes, I did just say that. 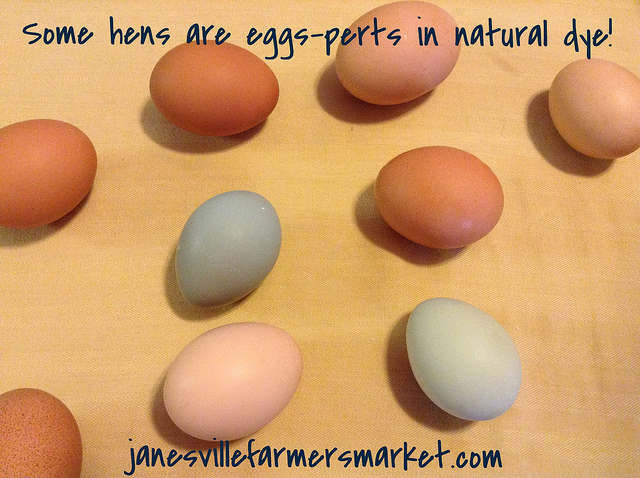 Farmers’ markets eliminate the middle steps in getting eggs to customers. Store eggs are washed, packed, cooled, shipped and stored in a temporary warehouse before being shipped again to sit on the grocer’s shelf. Farmers market eggs are washed, packed and cooled. Then they get sold right to consumers, sometimes within just a few days. To understand why fresh eggs don’t work well for boiling in the shell, it’s important to look at the properties of the egg shell. When eggs come out of a hen, they are covered by a protective coating. Because eggs must be washed before sale in this country, the coating has been removed before you buy the egg. Once the coating is removed, the permeable egg shell allows air to pass more freely in and out of the egg. As the egg sits in your refrigerator, some of the carbon dioxide in the egg goes out as oxygen rich air goes in. This exchange of gases raises the pH of the egg white, which causes the membrane around it to stick less. (reference) In addition, the egg white shrinks over time, causing the air bubble found at the round bottom of the egg to get larger. Both of these properties make older eggs easier to peel. The trade off is that the older whites do not support the yolk as well, so the yolk becomes off-center. 1. Start with the oldest eggs in your fridge (eggs will keep for 5 weeks past the purchase date). If you wish the yolks to be centered, store the carton on its side in the fridge for about a day. 2. Put the eggs in a single layer in a pan that is large enough to not crowd them too much. 3. Cover the eggs with cool water by about an inch. 4. Turn on the burner and bring the water to a complete boil. You want it to bubble all over but not be boiling so hard that the eggs roll around. Boiling too hard will cause the whites to become tough and the yolk to get that green sulfury layer. 5. Remove the pan from the heat while putting a tight fitting lid on it. 6. Allow the eggs to sit covered for 15 – 20 minutes, depending on the size of the eggs. 20 minutes is for jumbo eggs, 15 is for medium. 7. Pour out the hot water and run cold water into the pan. 8. Allow the eggs to sit in the pan of cold water, preferably with the sink running a thin trickle of cold water into the pan, for at least 10 minutes. 9. Refrigerate the eggs or peel and eat. Unpeeled eggs will keep for a week in the refrigerator. The eggs peel best in water. Perhaps you’ve heard the tip of shaking the eggs in the pan of cold water or seen the glass of water video below. Both tricks do actually work. Also, start peeling from the large end, where the air bubble is and try to get that inner membrane off with the shell. You may also place the cooked eggs in the freezer for 3-5 minutes. The cold will help shrink the whites away from the shell. Just don’t forget about the eggs in your freezer. Please share your own tips and tricks in the comments! Happy cooking!